Here are some photos of our latest inventory of used equipment for sale. 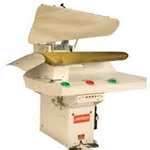 Our vast selection of used dry cleaning equipment. What are the advantages of used equipment? Dry cleaning business owners just starting out and those who want a cost-effective approach to managing equipment needs turn to our solutions to meet their specific business needs. This is why we offer discounted equipment. Discounted equipment is available in good condition, and this makes it an incredibly attractive option for business owners skeptical of the grade and quality of used equipment selected. Discounted equipment makes expansion much easier for business owners. For example, a business owner can purchase more equipment with the dollars saved in their equipment acquisitions efforts. Operations can focus on their expansion goals and worry less about the capacity to acquire new equipment. When purchasing equipment from a reputable dealer, business owners can have access to the quality equipment they want without the high prices.